Native Instruments has released a new soundpack for Maschine, Helios Ray, paying long-overdue homage to the Los Angeles-centered beat music scene and its recent influence on global electronic music. Echoes of Flying Lotus and Gaslamp Killer can be heard in the demo tracks for the collection. The package also bears the influence of the off-kilter late 90s West London broken beat scene and jazz-influenced dance music producers like King Britt and Mark de Clive-Lowe. 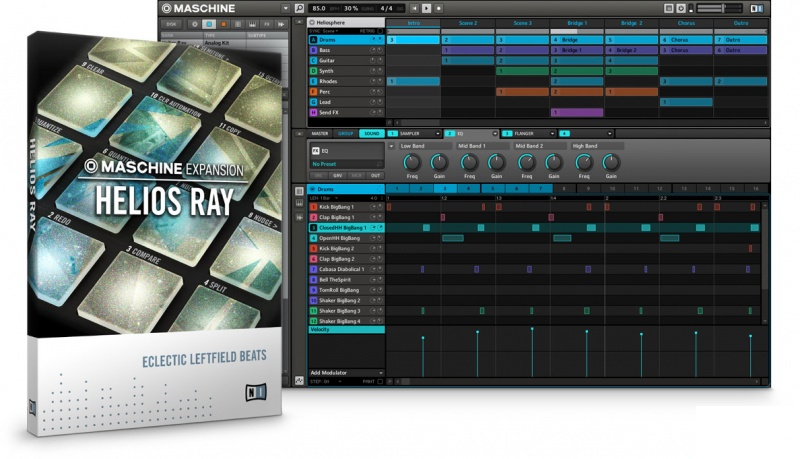 Helios Ray is a Maschine Expansion pack with drum sounds ready for experimental, futuristic beat-making. It has thickly effected and processed sounds for the crate-digging hiphop traditionalists, as well as cleaner, synthetic drums to give your productions an extra punch. The soundpack also includes Brazilian and Latin percussion including shakers and various afro-cuban drums as well as deep bass samples indicative of the genre. The preloaded patterns are all programmed by established LA beat scene producer Taurus Scott, a Low End Theory fixture and local favorite. Helios Ray includes 34 drum kits as well as 34 unique patterns. To round out the Helios Ray package, Native Instruments turned to Bell Sound in LA to record some jazz guitar licks in a pristine studio environment. Bell Sound has recorded artists like BB King, Johnny Cash and Barry White and seemed the appropriate setting for some jazzy riffs. The Melodic Kits section also includes classic samples of the Fender Rhodes piano, programmed to react intuitively to pad performance on the Maschine controller. Since Massive is also a part of the Maschine package, there are also 50 new presets for Massive with pads, leads and basses without forgetting the glitchy, noisy synths that beat producers love. While dubstep took root in downtown LA where the Pure Filth crew was delivering the UK flavors of Kode9, Mala and Caspa to the LA underground, Low End Theory was feeding a different sound on the city’s eastside. Artists like Daedelus, edIT (from the Glitch Mob), Gaslamp Killer and Flying Lotus helped cement the reputation of Low End Theory and LA’s beat sound and the night was soon drawing attention from higher profile musicians. The groundswell of support led to surprise sets from the likes of Thom Yorke (of Radiohead), Erykah Badu and even Riff Raff. One of the most important aspects in the beat scene is authenticity, so Native Instruments tapped LA-based producer and Low End Theory regular Taurus Scott to program patterns for the Helios Ray collection. Having got his start engineering and producing for G-Unit, Taurus has appeared on several Low End Theory lineups since 2011, recently signing with the Hellfyre Club label and preparing for his album debut in April of this year. Taurus has been a fast-rising producer and performer in LA, mixing an influence of dubstep, hip hop and eclectic futuristic grooves in clubs all over the city. Programming all of the rhythm patterns in the Helios Ray soundpack, Taurus sought to deliver the essence of what makes the LA sound so influential these days. “I love the LA beat scene. Everyone who is a part of the movement has their own sound, style and ways of performing.